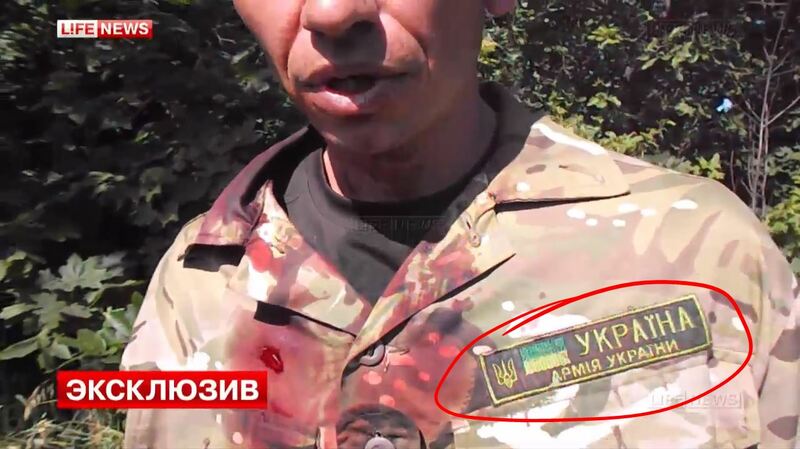 A deadly ambush has been taken place on a Ukrainian unit "Aidar" North of Lugansk on 18-6. 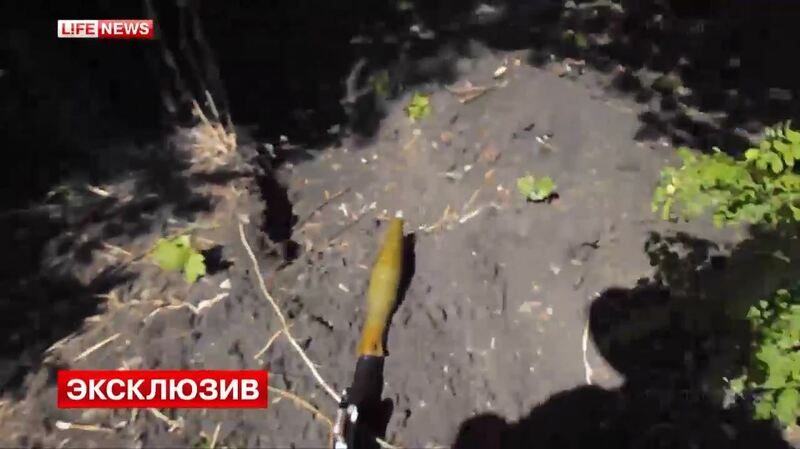 A burning vehicle is behind the bushes and the munition in it is exploding. 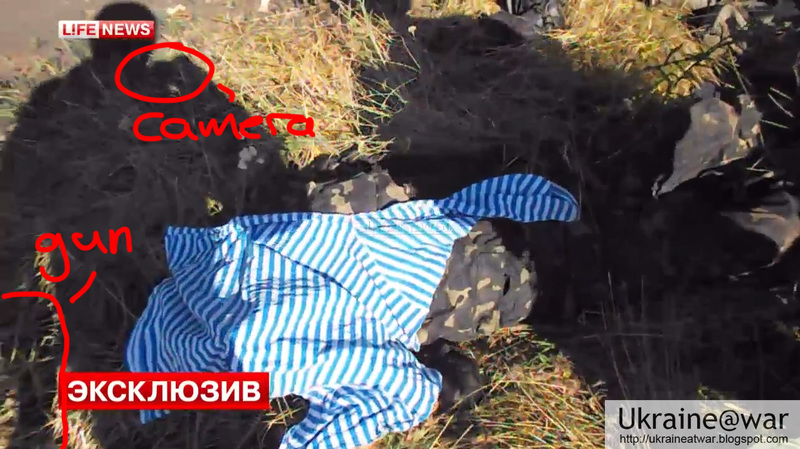 (GRAPHIC) This video shows the aftermath of the ambush. 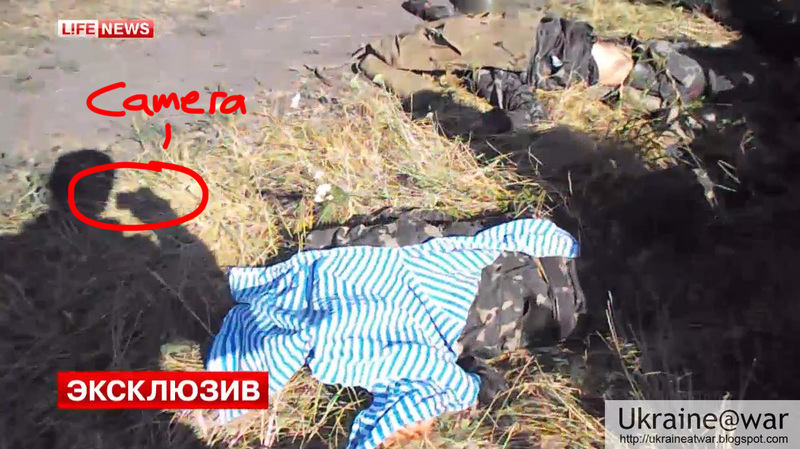 WARNING: it shows 2 dead, 3 wounded and a dying soldier. A translation of the text in the video can be found here. 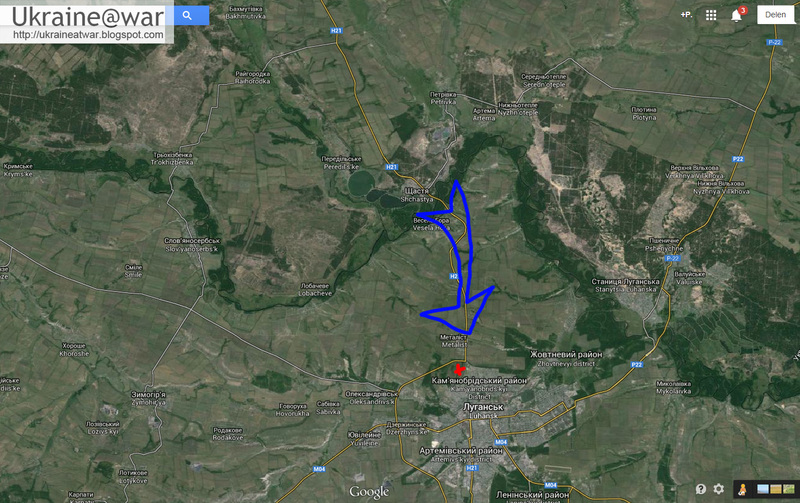 Blue arrow = Ukrainian advance. Red cross = approximate location of ambush. 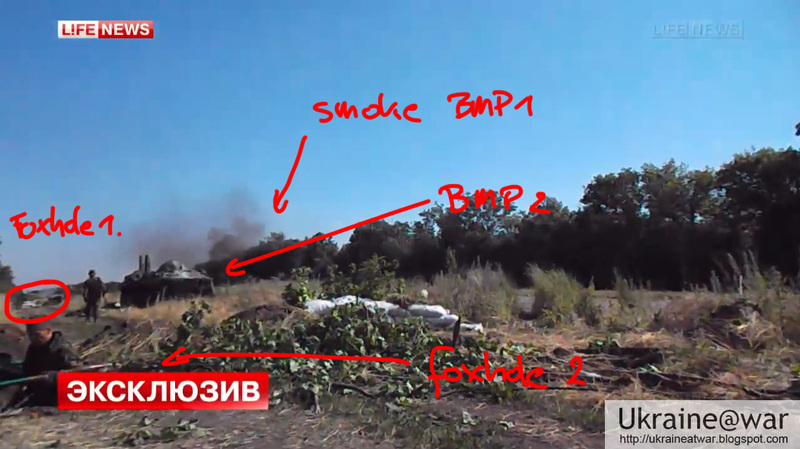 Not that BMP 3 is facing north. It must have been turned. This screenshot shows the shadow of the cameraman. He is filming with a pocket camera. 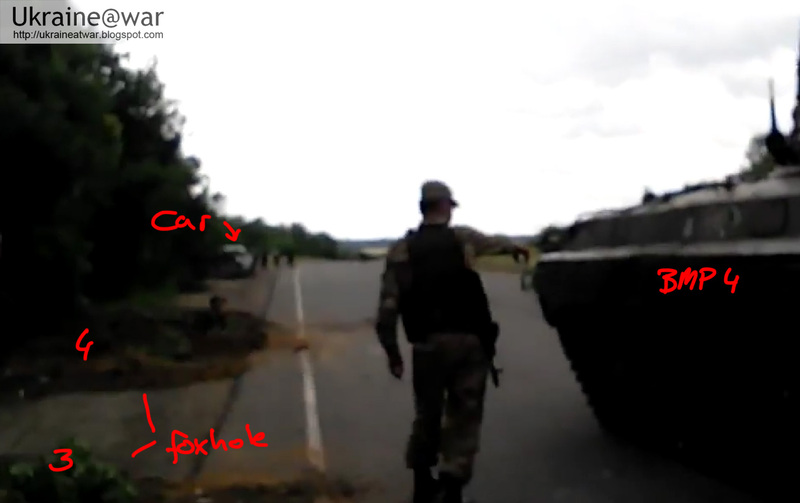 Not the hole in the side of the BMP, where must have been hit. 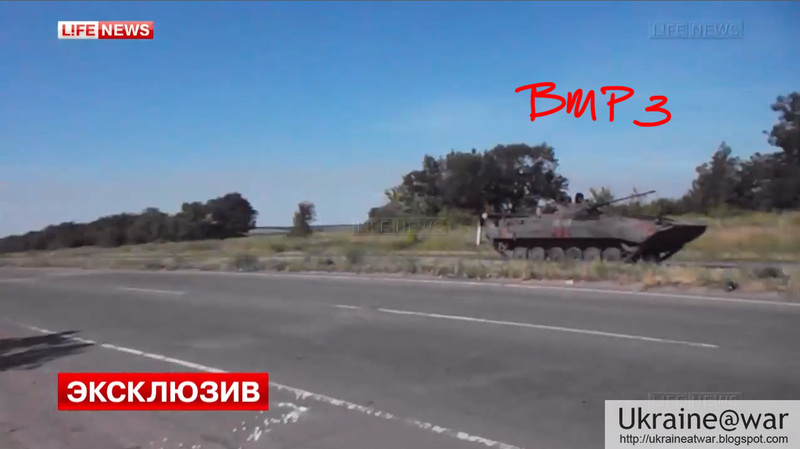 There is a chance that the 'jeep' actually is this 4th BMP, but it is hard to determine on the 2nd video. 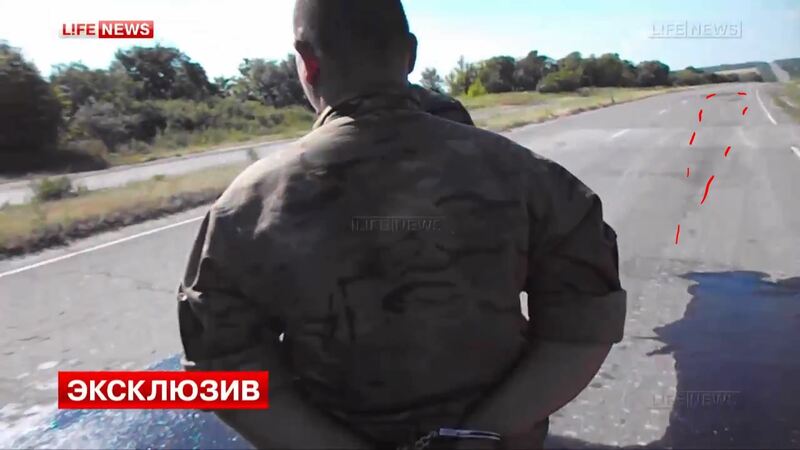 In the video a captured soldier said he worked 'on contract', meaning he was not a conscript. 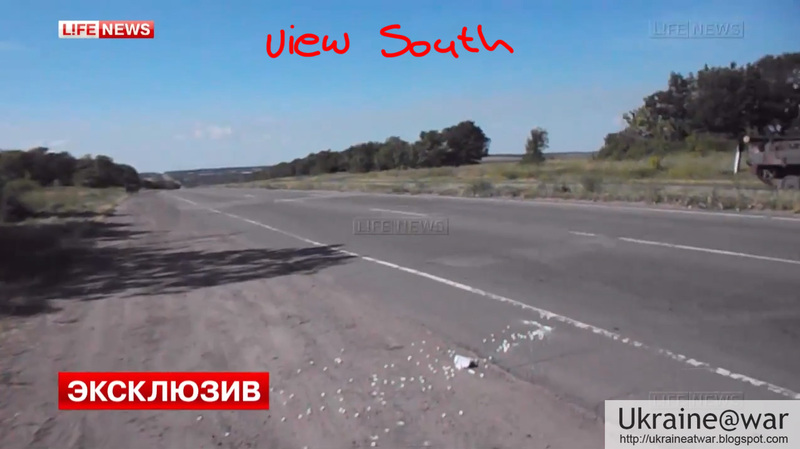 4 BMPs drove down the road closer towards Lugansk, without infantery support. They had not noticed the foxholes, or may have thought they were abandoned. 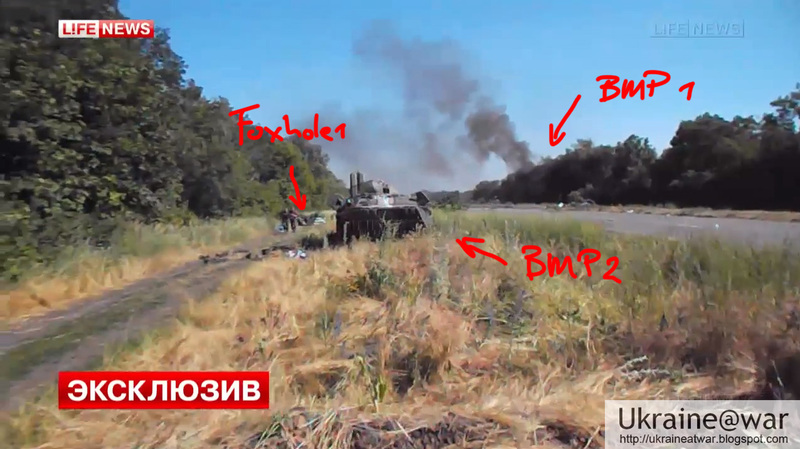 When the first BMP was already past the ambush location, they opened fire on the middle two, knocking them/the crew out. The first one had to turn around and come back to assist. The fourth went off the road onto the side. But both of them were taken out too. 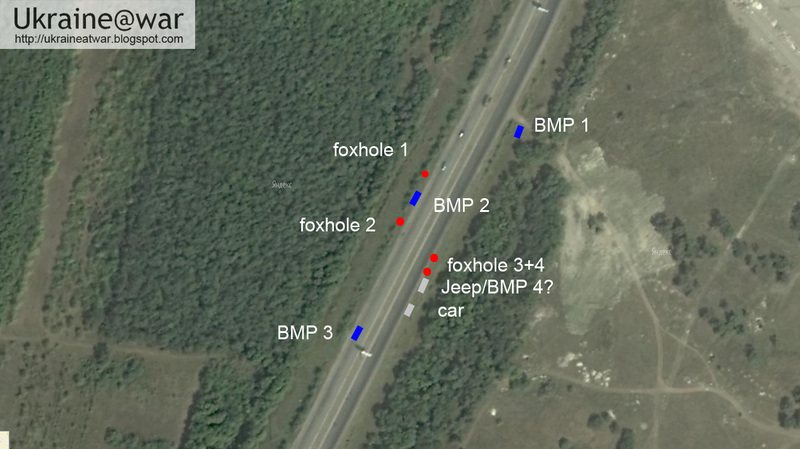 It is not smart to drive BMPs down a road without infantry support. The infantry is supposed to discover and protect the tanks from RPGs and the tanks are supposed to protect the infantry. 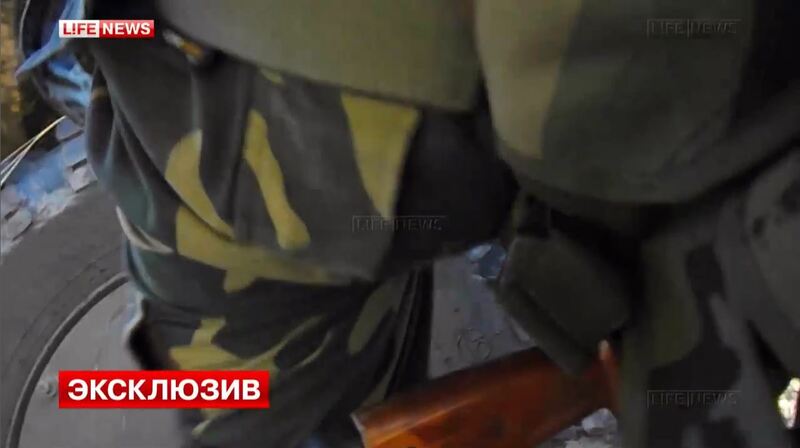 Note how the 'cameraman' actually is a soldier. The ambush was very professional. It is an art to hide and wait with shooting until you can get them all. 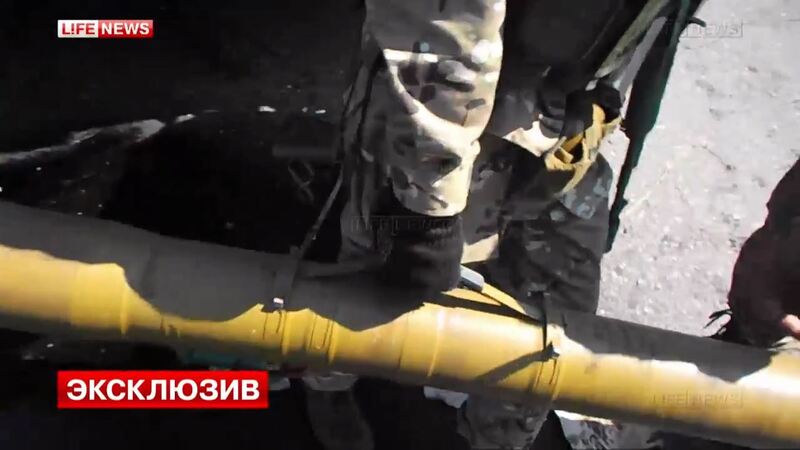 I really don't understand; is the Ukrainian Army THIS unprofessional??? It's really frustrating to see for them to make elementary tactical and operational mistakes, driving around without multi-unit support, without apparently any serious reconnaissance or scouts or embedded spotters behind enemy lines, etc. I have to grudgingly admit that the rebels seems to be much more professional at many locations. Has the unit patch at 4:31 on the second video been ID'd? 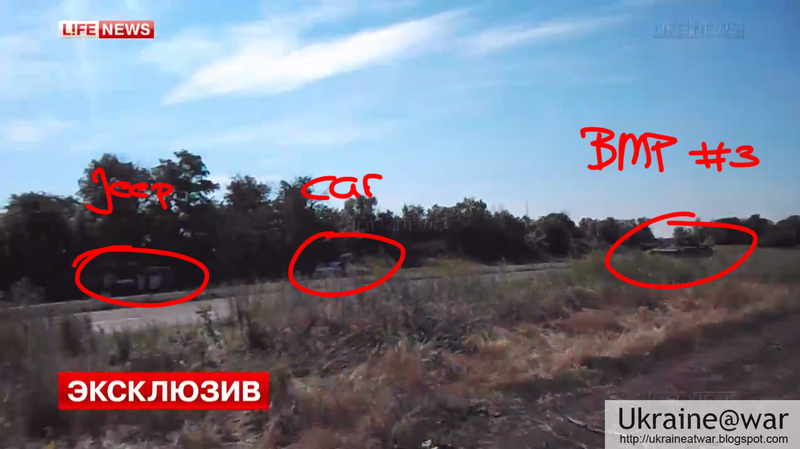 2) the cameran is this video https://www.youtube.com/watch?v=efMosh4xCow&oref at 2:30 say that the attacking force was composed of 2 BTR and 2 "tanks" (in fact BMP-2). 2 BMP and 1 BTR were still serviceable after the ambush. So my second guess is that the destroyed vehicle is a BTR. 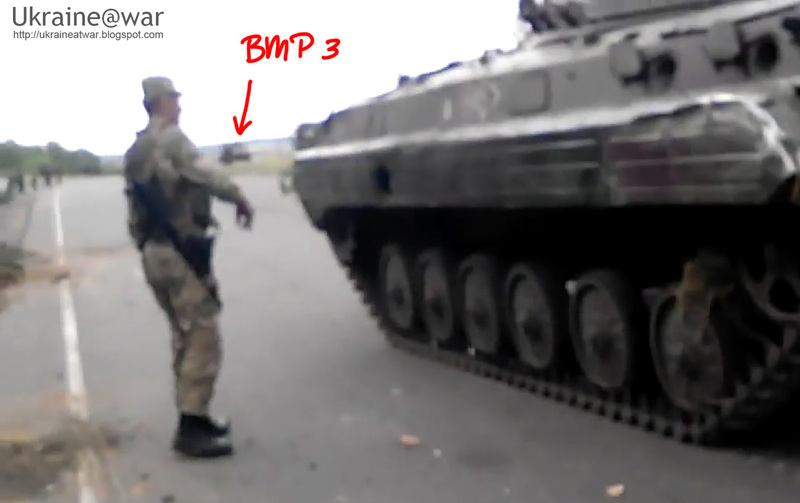 Most of machines are not a BMP, but BTR.